"You are fleeting, but your work is your memory." Jože Plečnik (January 23rd, 1872 - January 7th, 1957) was born in Ljubljana (then in Austria-Hungary), Slovenia. From 1894 to 1897 Plečnik studied with noted Viennese architect and educator Otto Wagner and worked in Wagner's architecture office until 1900. While in Wagner's office Plečnik was affiliated with the Viennese Secession, noted for its rejection of the decorative motifs of historic architecture in favor of a new, organic mode of ornament. From 1900 through 1910 Plečnik practiced architecture in Vienna, completing projects such as the Langer House (1900) and the Zacherl apartment block (1903-1905). These early projects are characterized by rational organization and planning typical of Wagner's designs for apartments and infrastructure, and richly decorated surfaces featuring organic motifs typical of the Secession. Plečnik's Church of the Holy Spirit (Vienna, 1910-1913) is remarkable for its innovative use of poured-in-place concrete as both structure and exterior surface, and also for its abstracted classical form language. Most radical is the church's crypt, with its slender concrete columns and angular, cubist capitals and bases. In 1911 Plečnik moved to Prague, where he taught at the college of arts and crafts. His teachings emphasized both classical architectural principles and folk-art traditions, and influenced a generation of architects who would help define the avant-garde Czech Cubist movement of the 1920s. In 1920 he began work on Prague Castle, a medieval structure that dominates the historic capital. The President at the time, Tomáš Masaryk, sought to renovate the facility and appointed Plečnik chief architect. From 1920 until 1934 Plečnik completed numerous projects at the castle, including renovation of numerous gardens and courtyards, the design and installation of monuments and sculptures, and the design of numerous new interior spaces, including the Plečnik Hall completed in 1930, which features three levels of abstracted Doric colonnades. 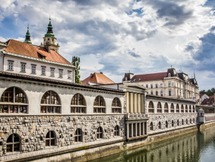 Much of the work on the Renovation of Prague Castle was completed while Plečnik was in his hometown of Ljubljana, where he moved to teach at the fledgling University of Ljubljana in 1921, following the invitation of fellow architect Ivan Vurnik. Plečnik would remain in Ljubljana until his death, and it is there that his influence as an architect is most noticeable. Working tirelessly throughout the 1920s and 1930s, Plečnik transformed Ljubljana through works such as the Church of St. Francis; civic improvements including new bridges, waterfront, banks, and sluices along the Ljubljanica River; new market buildings, kiosks monuments, plazas, and parks; a new cemetery Žale; and major buildings such as the Vzajemna Insurance Company Offices and the monumental University Library. After World War II Plečnik fell out of favor in the new Communist Yugoslavia, where his commitment to classical architecture and his devout Catholicism were viewed with skepticism. His teaching role at the university was gradually reduced and he received fewer commissions, although he did complete some smaller monuments, fountains and church renovations in the 1950s. 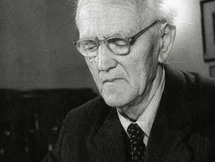 Plečnik died in 1957 and received an official state funeral in Žale. Plečnik's work, which was characterized by iconic, classical forms used in surprising, often unconventional ways, was largely forgotten in the 1960s and 1970s. Renewed interest in Plečnik's work developed in the 1980s and 1990s, as postmodernism led to a reconsideration of classical forms and motifs in architecture.